C. Four-body, ?Empire? by Joly, engine turned. Hinged gold cuvette. D. Silver, engineturned, brushed chapter ring with radial Roman numerals, outer minute track with dot markers, eccentric subsidiary seconds between 5 and 6. Blued steel Breguet hands. M. 52 mm., 23?? ?, frosted gilt, souscription calibre, standing barrel, jeweled train, duplex escapement with ruby roller, three-arm brass balance, the top pivot with pare-chute, flat blued steel balance spring, bimetallic temperature compensation curb fitted to the index regulator, repeating with a single hammer on a gong activated by a pull-and-twist piston in the band between 1 and 2. Dial and cuvette signed. Case with Joly?s mark, case and reverse of dial punch numbered. Diam. 56 mm. C. Four-body, Empire by Joly, engine turned. Hinged gold cuvette. D. Silver, engineturned, brushed chapter ring with radial Roman numerals, outer minute track with dot markers, eccentric subsidiary seconds between 5 and 6. Blued steel Breguet hands. 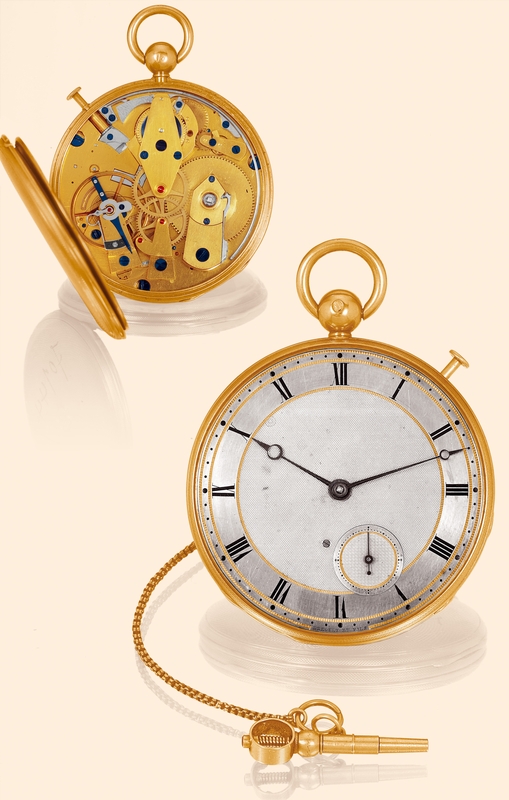 M. 52 mm., 23, frosted gilt, souscription calibre, standing barrel, jeweled train, duplex escapement with ruby roller, three-arm brass balance, the top pivot with pare-chute, flat blued steel balance spring, bimetallic temperature compensation curb fitted to the index regulator, repeating with a single hammer on a gong activated by a pull-and-twist piston in the band between 1 and 2. Dial and cuvette signed. Case with Jolys mark, case and reverse of dial punch numbered. Diam. 56 mm.